The government has raised cigarette prices, and young people under the age of 18 (21 in some places) are prohibited from purchasing tobacco products. Due to all of these efforts, the number of smokers has dropped 20% in the last decade. And all of these efforts had resulted in a major downward trend in teen smoking, but e-cigarette use, or vaping, may be slowing that decline, a new study shows. Many people use vaping to quit smoking, myself included. E-cigarettes and vape pens still contain harmful chemicals, though – but reportedly fewer than traditional cigarettes do. The e-liquid contained in e-cigarettes can be purchased in varying levels of nicotine, or no nicotine at all. So, smokers who want to use the devices to quit gradually reduce the amount of nicotine they vape until they are able to kick the habit entirely. In fact, when e-cigarettes first hit the market in 2007, public health experts had high hopes that the devices would lead to declines in tobacco use. But as you may have noticed, vaping seems to be everywhere. 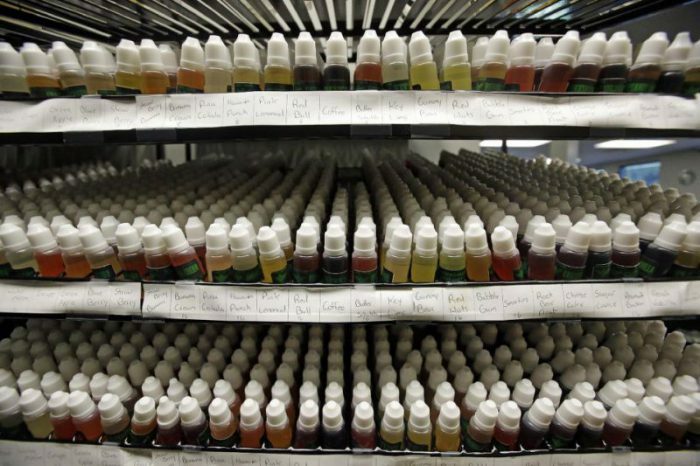 It’s this notion that e-cigarettes are safer that has led to an explosion in their popularity. That, and the hundreds of flavors of e-juice available on the market. Just as many people use them to quit smoking, many people also simply use them as an alternative to smoking. Unfortunately, it seems that many young people who might never have tried nicotine are turning to e-cigarettes to experiment, becoming addicted to the drug as a result. For the study, published July 11 in the journal Pediatrics, University of Southern California (USC) researchers tracked the use of cigarettes and e-cigarettes among 5,490 California high school seniors who graduated between 1995 and 2014. The number of students who reported smoking in the past 30 days has largely plateaued, the study shows. In 2004, the number of high school seniors who reported smoking tobacco in the past 30 days was 9%; in 2014, that number was just under 8%. The number of teens using nicotine, however – either through tobacco cigarettes or e-cigarettes – is increasing. About 14% of 12th graders in 2014 said they had smoked or vaped in the last 30 days. Researchers say they haven’t seen similar levels of nicotine use among teens since 1995, when 12th-grade smoking rates were 19%. It seems that e-cigarettes have enticed a whole new group of adolescents to nicotine use. And while the study focused on California teens, the researchers say the numbers are consistent with national trends. Dr. Jonathan Winickoff, professor of pediatrics at MassGeneral Hospital for Children and Harvard Medical School, authored an accompanying paper in Pediatrics. He said that this is the first study of e-cigarette use in adolescents to show such a strong longitudinal sample with such a drastic effect. The American Vaping Association (AVA) – a nonprofit advocacy group that champions the use of vapor products and e-cigarettes to help smokers quit – disagrees with the findings of the study. AVA president Gregory Conley said that many teen e-cigarette users don’t use nicotine in the devices, or don’t use them regularly, making them unlikely to move on to traditional cigarettes. “There’s no reason for hysteria over data like this. It’s important to point out that federal statistics have suggested that cigarette smoking levels among teens are hitting lows. Some 11% of teens surveyed in 2015 said they smoked within the last 30 days. That year, 16% said they had used e-cigarettes.